The smell of seasoned beans wafts through the kitchen. At one counter, a small group wrinkles their noses as they chop cilantro, garlic, and onions for salsa. 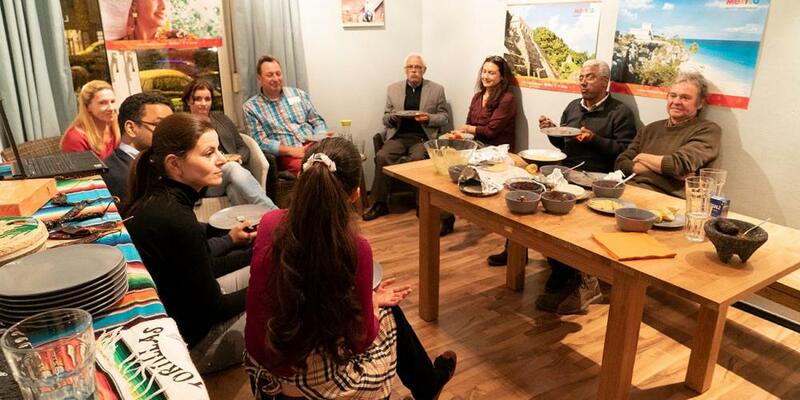 For many, it’s their first time cooking a Mexican meal–just one of many firsts visitors experience at Presence Kulturlounge. This unique Urban Center of Influence (UCI) is in the city of Frankfurt. Presence Kulturlounge builds bridges between the church and the local people who may not be readily open to religion. Visitors can participate in everything from cooking classes and art exhibitions to literature and poetry readings. It creates a welcoming space to ask questions and build community. Simret and his team are slowly building relationships with the locals and sharing the gospel with them. This work takes time and patience. Please pray that through Presence Kulturlounge, souls may be won for God’s kingdom. Serbian Girl Craves Peace of Sabbath-Keeping Sister Jelena cannot understand why her sister remains calm when their parents yell about her faith. Loma Linda Health The mission of Loma Linda University Health, urban church planting in Australia, and a missionary family in remote Alaska.